For a crisp, classic finish to external masonry, Earthborn Silicate Masonry Paint offers a breathable, high performance alternative to limewash. Earthborn Silicate Masonry Paint is water-based, virtually VOC free and highly breathable. Its special formulation makes it very hard-wearing, water repellent and can withstand severe extremes of weather. Use on all mineral-based surfaces e.g. stone, masonry, concrete, pebble dash and plaster surfaces. Although developed as an external masonry paint, Earthborn Silicate Masonry Paint can be used both inside and outside the home. It is especially suitable for renovation work on historic buildings and for covering old, sound silicate-based paints. It comes naturally as white or can also be supplied in a range of colours. 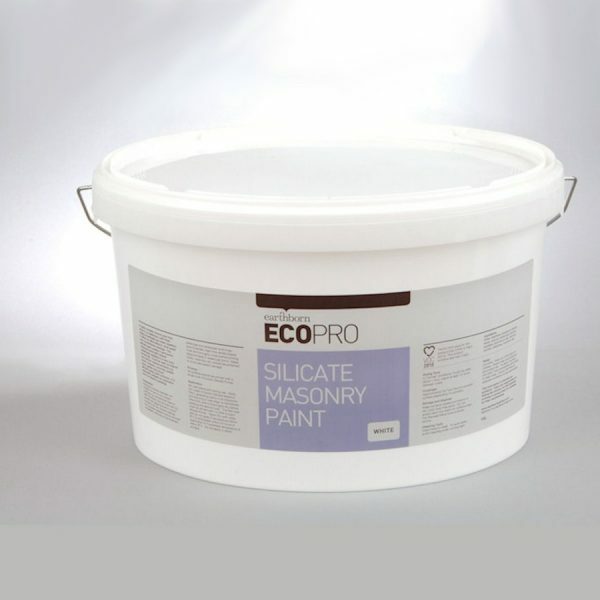 Silicate paint is highly breathable and can assist in regulating the humidity of the internal environment. It is weather resistant and washable. Dries to a soft matt finish and does not yellow over time. View the Somerset House: lime render with silicate masonry paint gallery. For optimum performance, first apply a base coat of Earthborn Silicate Primer. (Note: Earthborn Silicate Masonry Paint should not be applied over conventional ‘plastic’ masonry paints. Some clay surfaces may require special treatment). Great for: interior or exterior use restoration work and historic buildings new or old masonry all mineral surfaces including brick, stone, concrete, pebble dash, plaster and render.